Whitstable Yacht Club is an RYA Recognised Training Centre, and sail training and development are at the centre of the club’s activities. The club offers first class, professional tuition, a range of club boats for use and excellent training facilities. Members of the public can be given temporary membership on application for a course and much of our sailing development relies on the fantastic support of volunteer members. Adults. Come along to our recreational sailing sessions every other Wednesday and Sunday from late spring to early autumn. These sessions are for members who want to enjoy a recreational sail with safety boat support and want to improve their sailing skills with the availability of expert advice. Club boats available for hire. A small charge of £20 for the season covers costs for fuel and Instructor support. Cadets and Family sessions. These sessions are offered every week weather permitting from the end of march to late October. Volunteer adult and cadet instructors are present to provide rescue cover and advice. These sessions are ideal for giving cadets time on the water to put into practice what they have learnt from a RYA course and to develop their ability towards the next level. 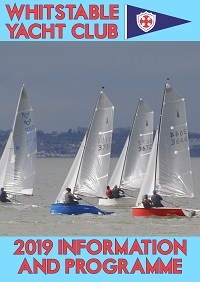 Please see the 2019 programme wyc.org.uk/cadets for the day and time of sessions, which will be on Saturdays or Friday evenings depending on the tide. Parents are asked to make a contribution of £40 per cadet (£30 for siblings) as a charge for the season to reward our cadet instructors for their invaluable assistance. Cadet friendly races. This is a new development for the 2019 programme. A series of Cadet races within the main club race series will be held with a cadet briefing 1 hour before the start and with an extra support boat on the water. Dates and times are scheduled in the club programme. Cadetfest. This will be the third year of Cadetfest. 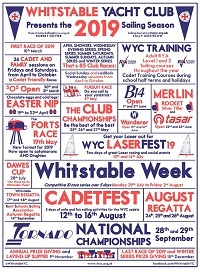 Another exciting week of activity including day sails, race day with cadets from other clubs and fun sailing, will be held over the five days of August 12th-16th. Adult sailing tuition is carried out in small groups of no more than one to six students to one instructor. Courses are offered for RYA level one (Start Sailing) and RYA level two (Basic Skills) to be a competent sailor. Courses are held over two days at a weekend. Please see the Courses Schedule for dates. Youth tuition (up to age 16) is based on the RYA National Youth Sailing Scheme and the courses, each lasting 3 days, are programmed in 2019 for school holiday and half-term weeks. Students are taught in groups, led by an instructor. By taking appropriate courses and through practice in cadet sessions we have found that even the youngest of our cadets can go from being a complete beginner to confident, independent sailing in just a season. Windsurfing equipment hire is available for people wanting to try windsurfing at Whitstable. You do need some experience to hire, and unfortunately we cannot currently offer Windsurfing lessons. Whitstable is a great place to progress your windsurfing owing to the flat, shallow water at low tide. Hire is arranged on application to the Training Administrator: training@wyc.org.uk. Cadet Courses (3 days): £100 (or £147 if not already a member to include cadet membership). Cadet fest (August 20- 24 inclusive): £100. Adult Courses (2 days): £100 for members £164 for non members (including £44 temporary membership for 4 weeks). Tuition on an individual, two person or small group basis can also be arranged at times outside the main programme. Please contact Ruth Oliver, training administrator, to arrange for a course or tuition tailored to your requirements. This could be ideal for beginners and also for developing advanced or racing skills.